2 Sequencing Parts, Plasmids, Etc. 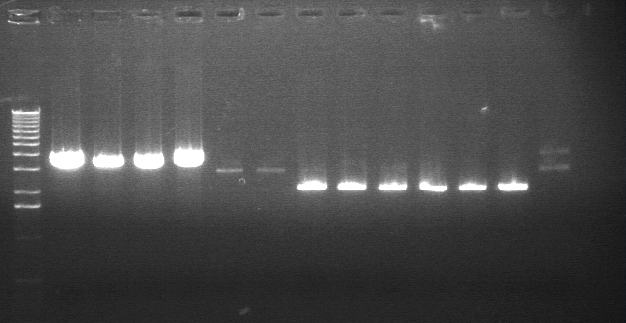 Restreaked P93 (1:3), P92a, and P93b--all successfully transformed in S1--to detect YFP at 30 and 40 degrees. 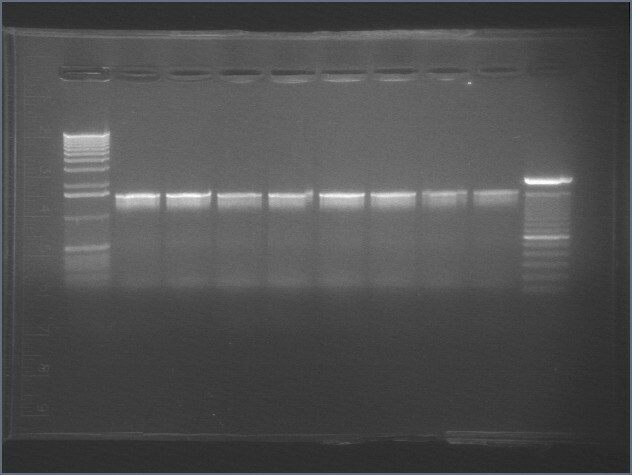 S1 P93 (1:3), P92a, and P93b plates grown at 30 and 40 degrees failed to demonstrate any difference in YFP expression. Both expressed very low, if any, YFP. 2hrs Diluted 1000 fold, grown for 5 hours. Diluted 1000 fold, grown for 5 hours, diluted to same OD range. Strain Replicate 30 30 + 1mM IPTG 40 42 30 30 + 1mM IPTG 40 42* DID NOT SHAKE FOR TWO HOURS IN THE MIDDLE. 40 42* DID NOT SHAKE FOR TWO HOURS IN THE MIDDLE. These arrived 7/25/08, and were reconstituted to 100uM. 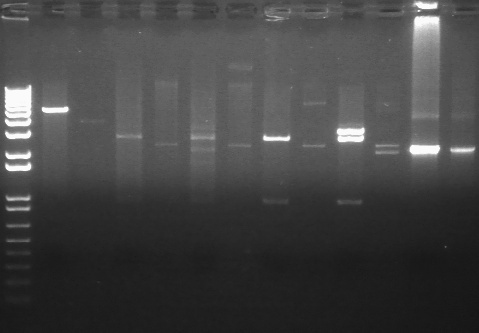 Digested composite plasmids to verify size. Also includes transformed P28 and the thermoinducible lac system. 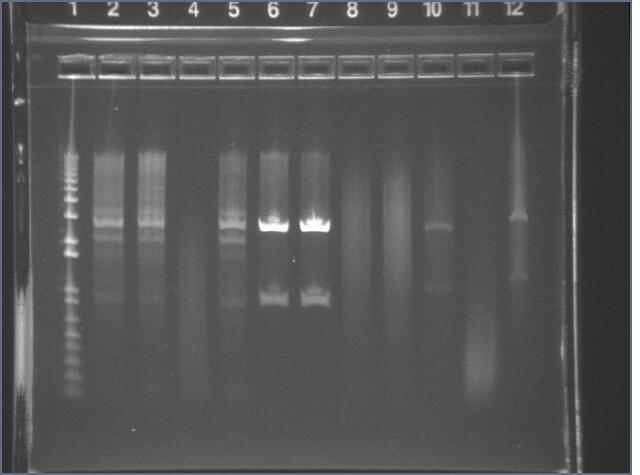 Extracted and purified S1 P75a 1 and P75b 1, but P64 07 has incorrect bands. 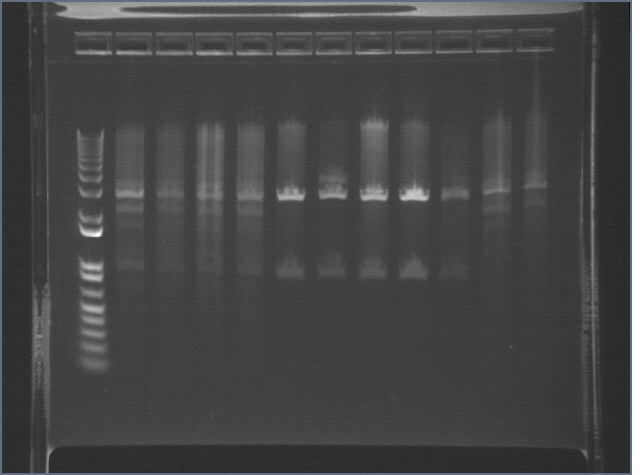 Desphosphorylated S1 P75a 1 and P75b 1 same day. Faint band was detected in P64 (?) but was not visible under UV when cutting, so not extracted. Will try digestion of P63, which has worked for Meng Xiao and Thilini before. 7/25: Almost all plates were blank except for positive control. One faint, questionable colony found on plate with 1 uL ligation reaction-- picked for Saturday. 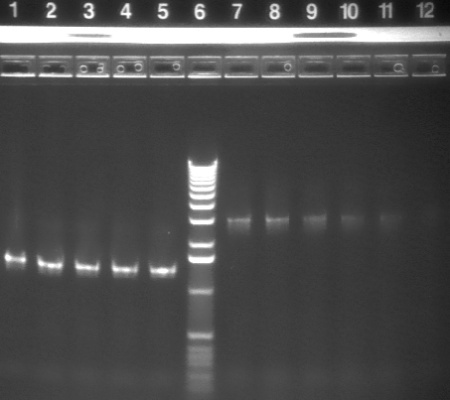 95 bp bands became fainter (and undetectable with gel mold on) after running the gel for more time. E1 P75b, P63a, and P63b were extracted and purified. 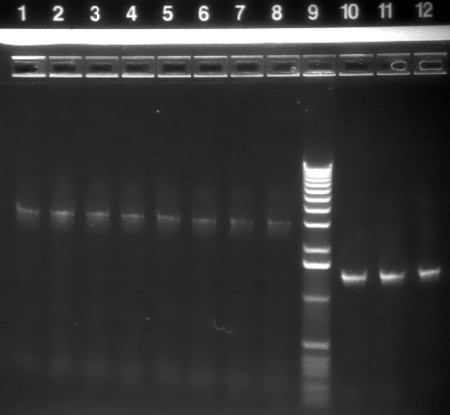 E1 P75b was dephosphorylated using the Roche T4 Ligation Kit Alkaline Phosphatase. S1 P75a + P63a (6:2) Kan 1 Single colony is fluorescent. S1 P75b + P63a (6:2) Kan 1 Single colony NOT fluorescent. Used primer sets RBS and BIG. Prepared enough for 4 standard reactions (50 uL each), and split into 8 reactions in strip top tubes. 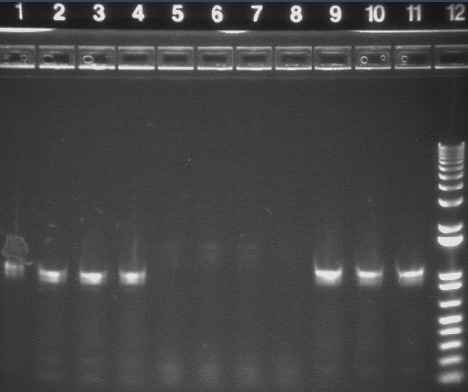 Added a total of 2 uL of PGW7 plasmid to each reaction mix (0.25 uL plasmid per 25 uL reaction). Amplified region is cI857 coding region only, and primers have Biobricks prefix, suffix, and RBS. All bands were extracted and purified. Amplified region is cI857 coding region and 200bp upstream and downstream, and primers have Biobricks prefix and suffix. Made ~600 100uL (some were 200 uL, indicated by green dot on top) aliquots from 1L of culture. Done as per Jason's lab's protocol. New cells seem to work, but tested heatshock times with puc19 7/25/08. Attempted to ligate p40 cut with SP (w/ RBS) to mtrB cut with XP. 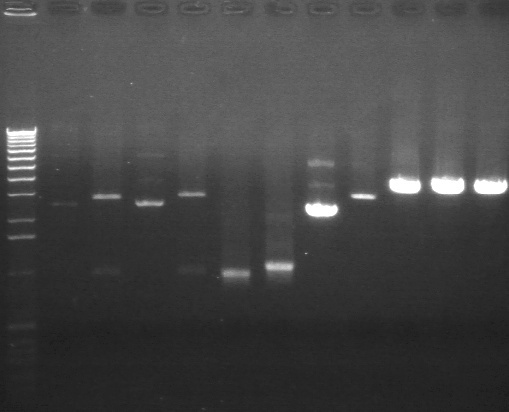 Thus far, the ligation has not worked. 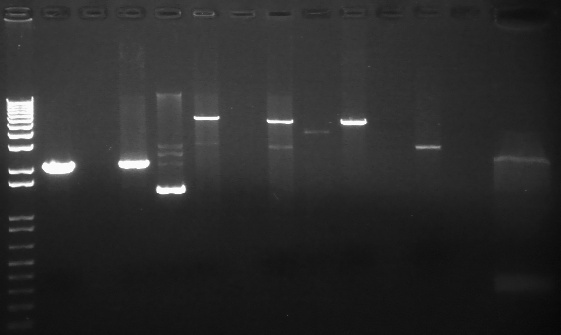 Thus far, none of the attempts to extract flanking regions from the genomic DNA have worked. 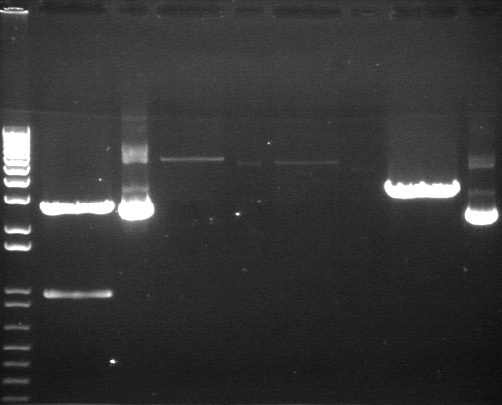 We are troubleshooting this now and will run positive controls with known DNA samples to check the efficiency of our Phusion Polimerase. 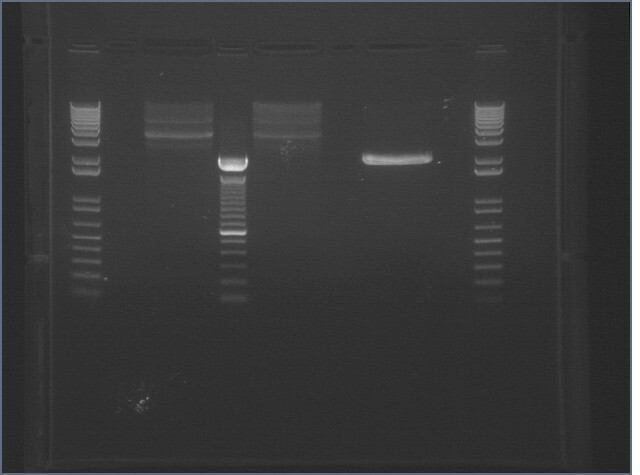 Transformed into new dh5α competent cells w/ volumes of 1, 3, and 5uL, using Jason's new protocol. As a control transformed 1uL of pUC19. 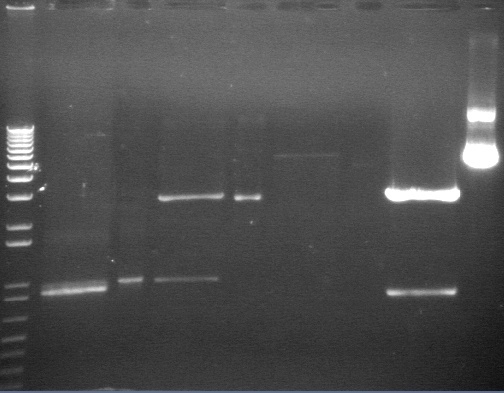 No bands on gel from any of the conditions. All the temperatures seem to have worked (51 was not loaded due to # lanes on gel). Expected product size ~2.1kb. Ladder is 1KB. Products from different temperatures combined and gel purified. 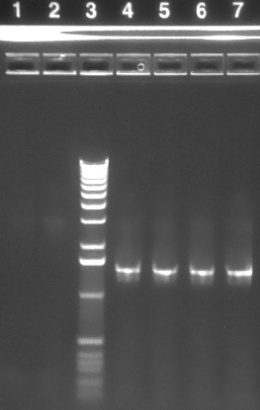 PCR product is the backbone of P1 and P3, including the RBS (B0032), weak and strong promoter respectively, and terminator. The ends have unique ApaLI and KpnI cut sites. Ends have unique ApaLI and KpnI cut sites. Used highest 4 temps of gradient. 400 μL (8 reactions) each of P1 and P3 were set up using a doubling of above reaction mix. The reaction conditions were the same except that annealing temperature was 45°C, and cycles occur 40 times. 100 μL (2 reactions) each of HO-pcyA and P51 MIT were set up using above reaction ratios. 40 cycles were performed with 55°C annealing temp and 1:35 extension time. Products will be gel purified along with products from optimization PCRs. We ligated P1A (vector) to CDF. 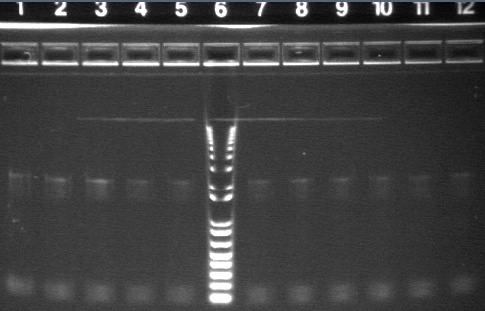 We used three different ratios of vector to insert for the ligation: 2/6, 1/5, 1/7. 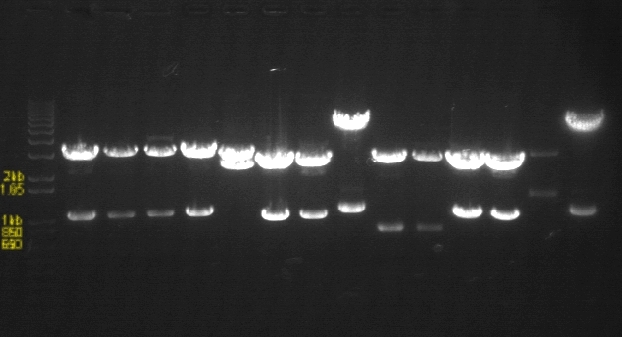 We used three different ratios of insert to vector for the ligation: 6/2, 5/1, 7/1. 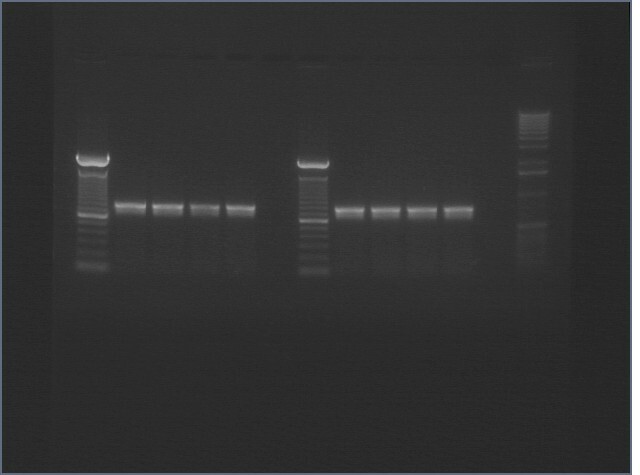 We used 5 μL of the ligation to transform TOP10 cells and 5 μL to transform the new DH5α cells. We also used 1 μL and 3 μL to transform DH5α. 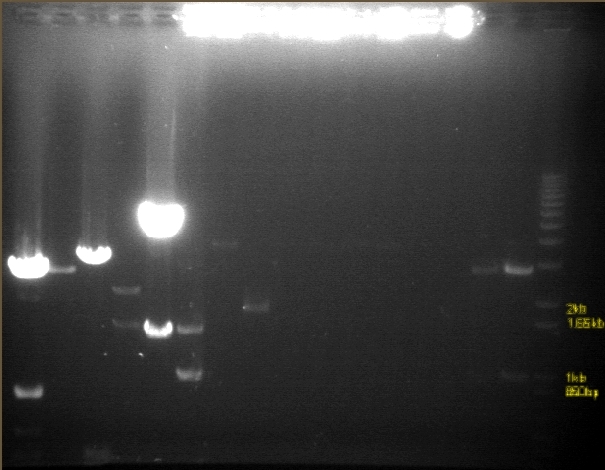 We used pUC19 (1 μL) as a positive control to test the efficacy of the new DH5α cells. Ligations were performed using standard protocol. New homemade cells were heat shocked for 40s, and incubated in 200μL SOC for 1 hour prior to plating on prewarmed plates. Vectors were dephosphorylated with Antarctic Phosphatase as per NEB's protocol. 2 non-fluorescent colonies picked for 5mL cultures for each plate when possible. Note that 45s heat shock was used for DH5α, and cells were split onto 2 plates to accelerate drying. 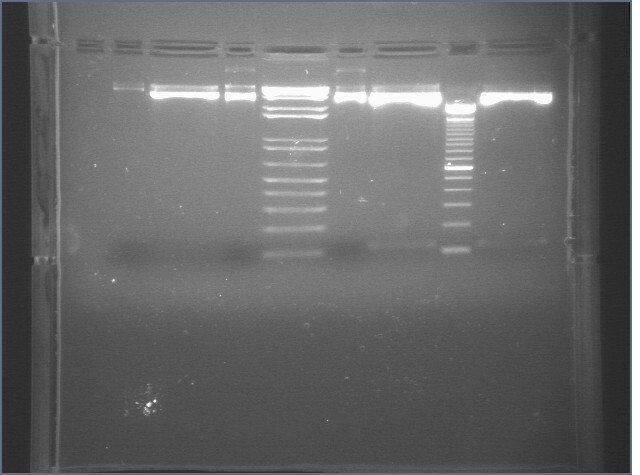 When possible, 2 non-fluorescent colonies were picked from each plate (fluorescence in the P1/P3 derived plasmids indicates P1/P3 vector religation). The 2 E2 P90+49 cultures failed to grow. Note that Kan selection was used, as that's carried on P90, although the transformation plates were Amp. 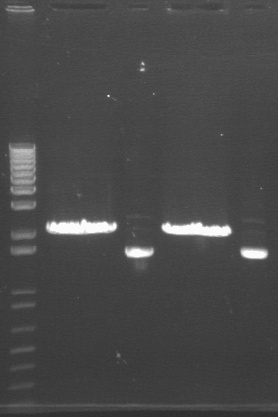 Cultures were set up again for samples 7-14, since the DNA seems to have not run properly. This page was last edited on 27 July 2008, at 21:16.